Today, apps are connected with an expectation to easily store information across multiple platforms and devices while still providing immediate and instant access to the user’s data and files. 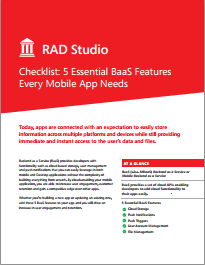 Backend as a Service (BaaS) provides developers with functionality such as cloud based storage, user management and push notifications that you can easily leverage in both mobile and desktop applications without the complexity of building everything from scratch. By cloud-enabling your mobile application, you are able to increase user engagement, customer retention and gain a competitive edge over other apps. Whether you’re building a new app or updating an existing one, add these 5 BaaS features to your app and you will drive an increase in user engagement and retention.